HCA Piano Concert Series presents A Romantic Evening with Frederic Chopin featuring Valerie Tryon with a Nocturne dedicated to the Artists. 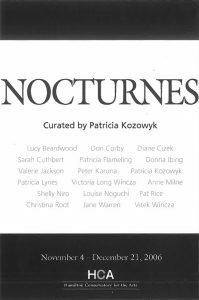 Nocturnes is a gathering of images from dusk to dawn. An exploration of the idea of night. A celebration of established and emerging artists.